A figure who took over the rotating Real Madrid bench in November presumably as a place-holder for Mauricio Pochettino until the summer is now staking a claim on the role on a permanent basis. That's certainly the buzz in the Spanish capital on Monday as the news of Real Madrid's comprehensive 3-1 victory over Atletico Madrid in El Derbi still sinks in. It's all very Coach Zizou flashback, when a manager with limited experience managed to win a huge amount of trophies before realizing the only way was down and going on a very long vacation. Over the past ten days, Solari has put Real Madrid in the driving position against Barca in the Copa del Rey with a draw at the Camp Nou, and clawed back the deficit to the same club at the top of the La Liga standings to just six points. 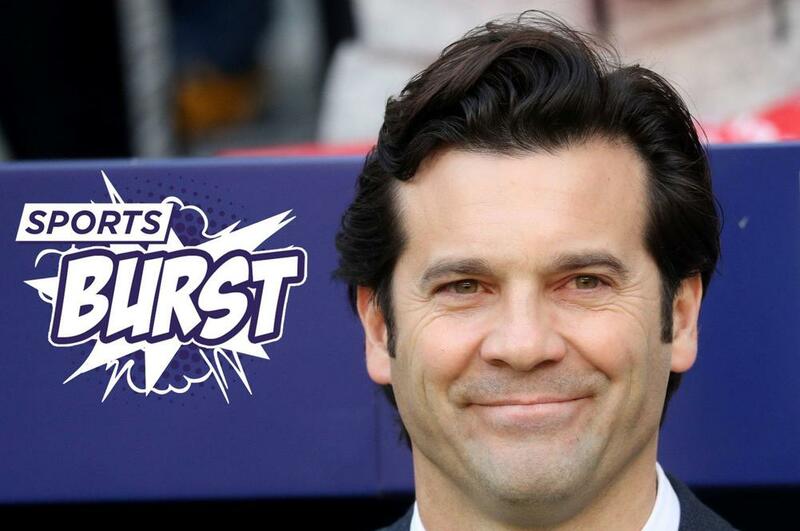 Challenge three in Solari's gauntlet of sport is coming up with Wednesday's Champions League tie against Ajax. This Real Madrid turnaround - and Barcelona's wobbles - will be one of the big talking points of the Locker Room with Kay Murray and the gang at 7:30PM ET / 4:30PM PT. But all that is looking waaaaaaay ahead to Wednesday's Champions League action. Tuesday is still to come with the stand-out tie of the round - Manchester United taking on PSG. A flakey, down in the dumps club facing one of the glamor teams of the world. That was the situation less than two months ago before Ole Gunnar Solsjkaer took over from Jose Mourinho at Old Trafford and PSG took a dip in form with Neymar out of action. Now the tables are turned a little. United's Norwegian knight can even a-fjord a slip-up in the Champions League after ten wins from eleven seems to have handed the former player the United job on a permanent basis, although an announcement from the club's bosses on this topic may not come until the end of the season. Solsjkaer will be speaking later today, as will PSG boss Thomas Tuchel who will discussing the chances of Edinson Cavani playing in the game after picking up a hip injury at the weekend. The Portuguese Premier League enclave of Wolverhampton Wanderers is in action on Monday in the final match of the weekend in England. The club led by Nuno Espirito Santo and an awful lot of his Portugal countryman has been the mighty minnow of the EPL season and currently sits in seventh spot. Newcastle United are the visitors to the English West Midlands in a game that could see a debut for newly-arrived, Paraguayan poacher Miguel Almiron. Alaves, the once mighty minnows of La Liga - and now flagging after three defeats in a row - is in action today in Spain with a home clash against Levante. That game is live on beIN SPORTS at 3PM / 12PM PT. The XTRA with Kevin Egan is the place to be to catch all the best action from the day on beIN SPORTS at 7PM ET / 4PM PT. It has been a whole 11 days or so without Barcelona being involved in signing a player. But the rumor mill is back up again with the German press claiming that the Camp Nou campaigners will be making a summer move for Serbian and Eintracht Frankfurt striker, Luka Jovic. Jovic has scored 14 goals this season in the Bundesliga and is currently on loan from Benfica, just to make matters muddier. While that deal looks doable, a more outlandish rumor has sprung up with Juventus set to launch a massive bid for Mohamed Salah from Liverpool for $200 million, as a replacement for the misfit Paulo Dybala. Our Sports Burst team will be all over that and every other story on Monday in our live show at 12PM ET / 9AM PT. Just head to the beIN SPORTS USA Facebook page, or watch back at your leisure.